For this show, Mark Staff Brandl, a U.S.-born artist who has lived in Switzerland since 1988, drew upon his American roots to create a body of work that is easily accessible, intellectually demanding, and warily subversive. On view were 60 small-format (10 by 6 inch) paintings on paper done in oil, acrylic, gouache and ink. In their size, style and color schemes, these works imitate traditional comic book covers —hence the title of the show, "Covers." The show was hung as a compact installation in the form of a wave whose motion was carried forward by the vigor of the faux covers' brilliant colors. 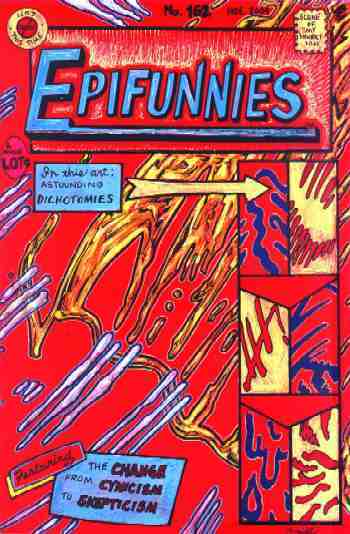 Epifunnies (2004)—a construction combining epiphany and funnies—exemplifies Brandl’s approach. The composition features an array of graphic elements in soft yellows and broken-up whites against a warm red background. The lines are robust, the colors sensual. full range of visual and intellectual tactics. Upward-floating tubular forms suggest speedlines as well as the tail of Superman’s cape, as if the Man of Steel himself had just flown off the edge of the cover. An arrow attached to the phrase "in this art: astounding dichotomies" points to a detail that looks like nothing so much as an abstract painting. At the bottom of the cover, still using classic comic book lettering, the artist states his main concern: "Featuring The Change from Cynicism to Skepticism." By postulating that there has been a metamorphosis from doubt to disbelief in modern society, Brandl questions the place of traditional values in today's world. A painter who also works in an abstract vein, Brandl seems to be commenting on his own work as well. An even sharper note of self-satire is struck in a cover that proclaims itself "A Soon to Become Famous Painting — with a Little Luck and the Right Curator Support!" Artists have been drawing imagery from comics since the era of Pop art, but rather than simply appropriating visually striking motifs, Brandl, who relies as much on written language as on graphic elements, employs the comic-book cover format as a tool to coax the viewer into a serious dialogue.